Lab Supply is proud to offer a number of enrichment devices for a wide variety of animals, including Flexi-Keys for dogs. Flexi-Keys are made up of polyurethane keys on a nylon ring, which makes them extremely long lasting, and able to take all the fun your dog will have with it. They are contaminant screened and certified, so these toys are perfectly safe for your pets to chew on. The variety of colors and textures the keys come in provide increased interest for dogs, and create a fun learning experience. 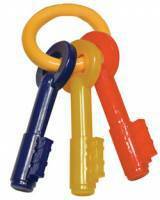 If you would like to know more about Flexi-Keys, please click here to view these products in the store. Here at Lab Supply, we are committed to making sure you find exactly what you are looking for. If you have any questions about Flexi-Keys or any other products we offer, then please click here to visit our contact page. We will be more than happy to answer any questions you may have.